I decided since it was World Card Making Day, it was appropriate I make a card! I don’t make a huge number of masculine cards, mostly only when required, so thought I would make one today. I began this card by cutting a card base and topper. 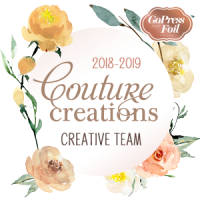 I cut a circle out of the topper, using the new Modern Essentials Cut, Foil and Emboss Nesting Circles. My aim was to get a gold ring around the cut-out piece. 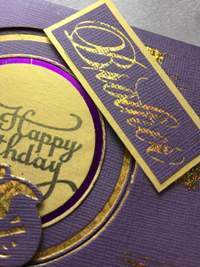 I then stamped the Happy Birthday on some yellow cardstock from my stash, and cut it out with a smaller circle die, this time using purple foil. I added some random spots of glue to the topper and put it aside to dry until sticky, then added left over (matching) foil. (Pushing it down onto the sticky glue means it will stick on the card.) I wanted it to look more distressed than anything. Next I took the topper and added dimensional foam tape all around the sides, as well as near to the circle, and added it to the cardbase. I then pushed the greeting through the cut-out circle. This gives perfect placement. 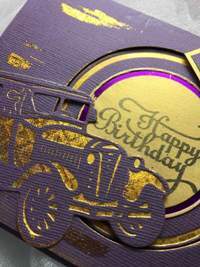 I used my Jalopy Cut, Foil and Emboss die, again using the same gold foil. 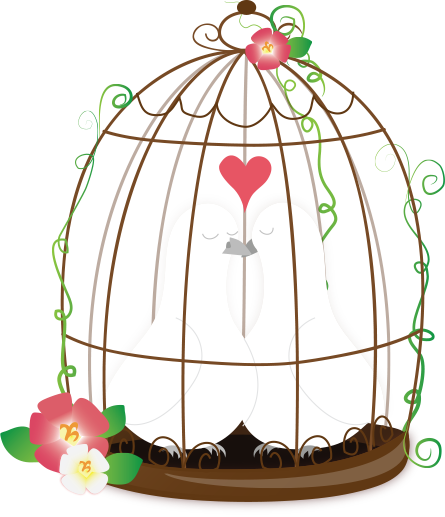 I added it to the same cardstock as the base and topper. 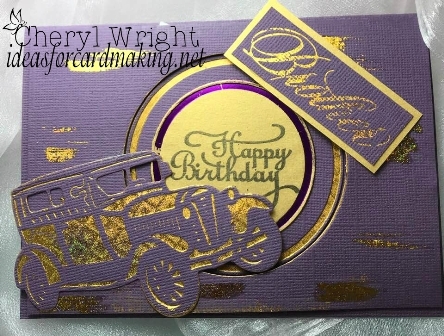 Lastly I used the “Brother” Hotfoil stamp, again using that same gold foil, then trimmed it and added it to the yellow cardstock, otherwise it would blend in too much. This is an awesome masculine card. I love the details and great colors. Great old car design. Thanks so much, Verna! I love that Jalopy, but admit this is only the second time I’ve used it. I must use it more! This is a great masculine card Cheryl, it’s blingy with the gold foiling but masculine as well, great job!